Zee Kraaszie Aorte Blog of Nicola Morton: I used to live in Brisbane but now I'm fighting aliens! I used to live in Brisbane but now I'm fighting aliens! hey i'm the last track on this most awesome sci-fi concept cassette about Brisbane. (can you see real bad music on the cover). out on virtual cool. thanks to matt kennedy. if you scroll down to the end of the post you can read my lyrics.. Launch Gig is on Friday Jan 16 at Bearded Lady. Capacity is 100 and there's lotsa popular bands playing so get there early? 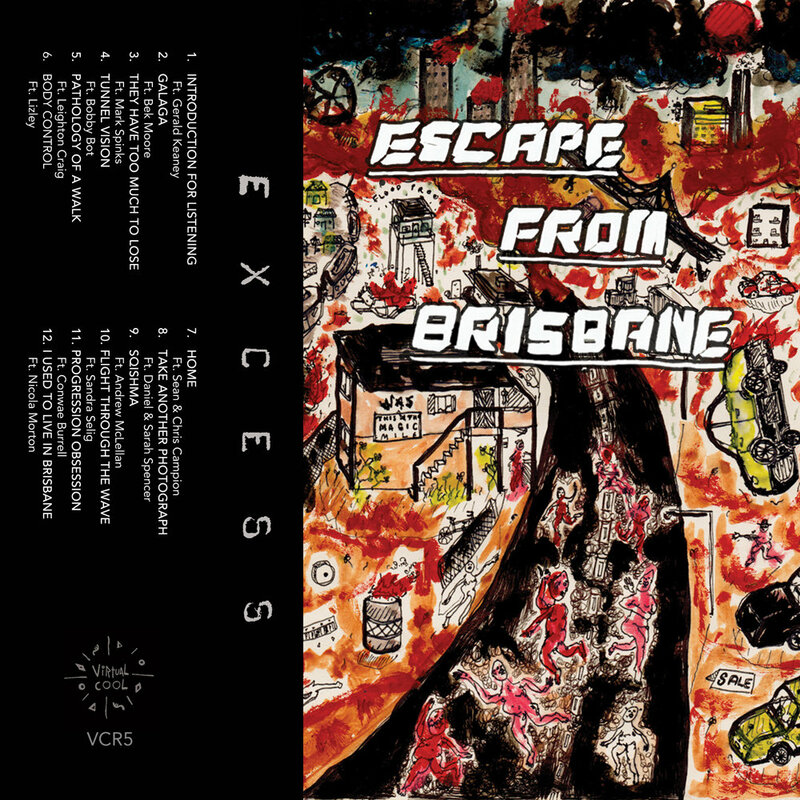 Escape From Brisbane is a concept album featuring instrumental compositions by Matt Kennedy (Kitchen's Floor, Eternal Soundcheck) and a variety of guest vocalists from the Brisbane music community. Taking inspiration from low budget 80's sci-fi soundtracks, the album is intended as a warped time capsule to preserve the personality of independent Brisbane music circa 2014/2015. Recorded over a period of 6 months, Escape From Brisbane features vocal contributions from 14 of the cities most interesting and unique musicians. Gerald Keaney (Gerald Keaney & The Gerald Keaneys), Bek Moore (Clag, Scrabbled), Mark Spinks (Gravel Samwidge), Bobby Bot (Wonderfuls), Leighton Craig (Primitive Motion), Lizley (Bitchratch), Sean & Chris Campion (Multiple Man), Dan & Sarah Spencer (Blank Realm), Andrew McLellan (Cured Pink), Sandra Selig (Primitive Motion), Conwae Burrell (Extrafoxx), and Nicola Morton (Club Sound Witches, Equalizer 2K). The cover artwork was painted by Dusty Anastassiou (Dag, Scrabbled).